← Hudson Valley Foraging: Ramps! “Do you want to come ramping with me?” Christopher asked. It was a big deal for him to ask me, I knew, because my husband typically enjoys communing with nature—and this particular stealth pursuit—alone. Still. I found myself wiggling out of potential couple bonding time. “Hmmmm, maybe next time?” I said, knowing full well that “next time” meant never. Don’t get me wrong. I love ramps (above right). In fact, I eagerly anticipate their pungent arrival in the Hudson Valley every spring, and holding our own ramp fest in our farmhouse kitchen. 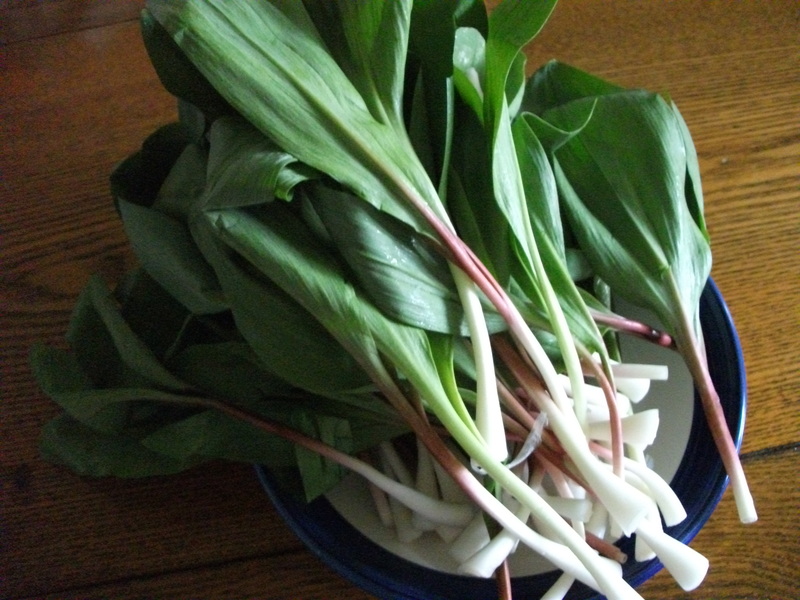 While I love the bounty that foraging yields, I don’t like foraging for ramps, myself. As Christopher details in his post, foraging for ramps involves dressing carefully, plus a meticulous head-to-toe tick check afterwards. Not to mention, you have to have a good eye for spotting ramps (versus their imposters); a willingness to squat, dig, gather and repeat… Being a gatherer requires patience—not my strongest suit. It is in the kitchen that I’m most comfortable celebrating the bounty of the forager. This time of year, I crave cleansing, spring tonic vegetables, basically, anything from the aromatic allium family—onions, shallots, garlic, chives, scallions and leeks. I am especially mad about ramps (a.k.a. wild leeks, or allium tricoccum). Not so much cultivated leeks—with their white stalks and tough, flat green leaves, they are my least favorite allium. Nutritionally speaking, cultivated leeks (left), which contain smaller amounts of the same allyl sulfide compounds found in garlic and onions, hold their own. Rich in kaempferol (also found in blueberries, spinach, kale, broccoli and onions), a flavonoid, for which a high intake has been linked to a reduced risk in ovarian cancer, domesticated leeks are also a good source of vitamin B6, vitamin C, folate and iron, as well as magnesium, calcium and copper. But, with cultivated leeks, only the white stalk is edible. Grit often lodges between its tightly sheathed base layers, making it hard to clean. Or, as I see it: maximum effort for minimal return… I also like sharp, bright, assertive-tasting and smelling allium aromatics. And leeks taste, well…meek, IMO. On the other hand, ramps, or “wild leeks” are unabashedly pungent and aggressively flavorful, a testament to an abundance of sulfur compounds, which, according to the American Institute for Cancer Research, may play a role in preventing cancer. Ramps are also rich in the trace mineral selenium, which studies have shown to reduce the risk of certain cancers, like colon, lung, liver, gastric and esophageal. Dr. Philip Whanger at Oregon State University, whose research has focused on selenium, has observed that ramps are able to absorb and hold more selenium from the soil in less time than other cancer-protective foods, like onions, garlic and broccoli. Ramps also contain Vitamin A, Vitamin C, and chromium. Unlike their domesticated cousin, ramps can be eaten in their entirety, from their scallion-like bulbs to their broad lily of the valley-like green leaves. We like ramps to shine in all their untamed, garlicky, green tonic glory. Which means no accompanying meat, fish or dairy. Just ramps. I cook our foraged ramps in flat-bottomed, well-seasoned wok. It’s fast, easy and works well on either a gas range, which we have in the City, or on our (inherited) electric stove in the country. If you don’t have a wok, try cooking in a saute pan with deep sides or Dutch oven. 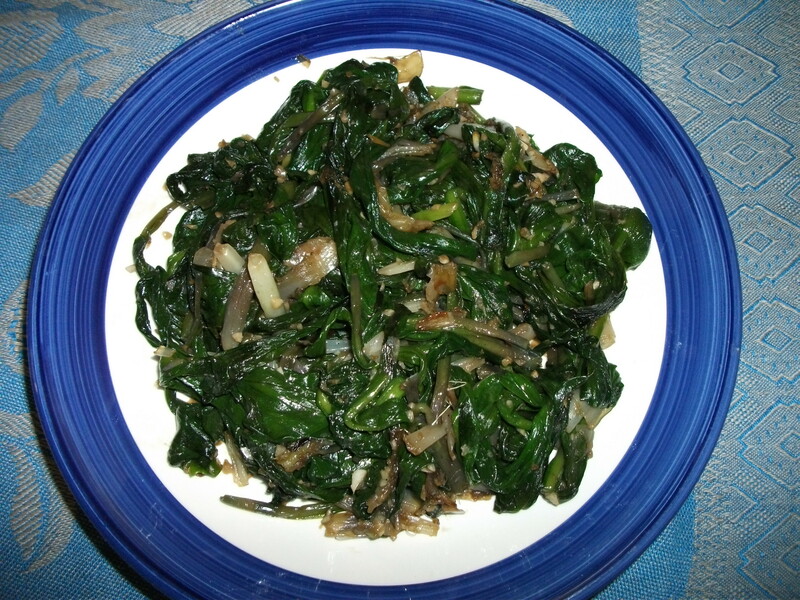 We like our ramps cooked simply and garlic-enhanced—I usually add several minced cloves of garlic to a mess of ramps. Ramps have a garlicky bite, yes. But a quick sauté, followed by a just-long-enough braise renders them tender and sweet. Add chopped white bulb, sauté quickly, then lower heat to medium low. Saute 2-3 minutes, or until the white bulb softens and browns somewhat. Add minced garlic, sauté until just incorporated. Add green leaves, raising heat to medium. Saute until all the leaves wilt, about 2-3 minutes. Add ¼ cup water, stir quickly through ramps or garlic that may be sticking. Reduce heat to low (or simmer) and cover. Cook 8 minutes. Uncover, if there is any residual water, raise heat and continue stirring ramps until all the water has evaporated. Add kosher or sea salt, to taste. Serve. This entry was posted in At Our Farmhouse, Food, Health, Home Cooking, Hudson Valley and tagged allium, cancer-fighting food, cooking ramps, Hydson Valley, kaempferol, leeks, ramps, selenium, wild leeks. Bookmark the permalink. Like you, I get ramp fever in April… I discovered grilled ramps at Guy Jones annual “rampage” event (www.BloomingHillFarm.com). Simply tossed with olive oil and sea salt, thrown on the grill for a few minutes, they are delicious! And they hold up to grilled meats that way. But I keep my wok busy the rest of the week when barbecuing is not an option. Thank you for sharing, Stephanie. This year, we had our first ever Ramp Fest in Hudson… something to look forward to next spring. Grilled ramps are a great, simple preparation…kind of like grilled scallions, also delicious. Yes, for us, too, the wok is definitely a weekday workhorse! !